We rank on the top position while it comes to the Y strainer, as we have the entire prowess to manufacture a high quality standard range of the Y strainer. Our comprehensive range of the Y strainer is manufactured in synchronization to the ISO 9001:2015 standards and also tested following API standards in order to ensure flawless quality. Shell test, low pressure closure test, high pressure closure test, visual examination of the manufacturing are some of the tests that we perform under the utmost vigilance in order to meet the API 598 standard requirements and which hence our range of the Y strainer is also famous as the API Y strainer in several regions. This API Y strainer Manufacturer is renowned in the market for its efficient filtration ability and leak free performance all through, and is used in the gas, steam, and liquid downstream in order to remove sediments and other impurities with the highest precision. 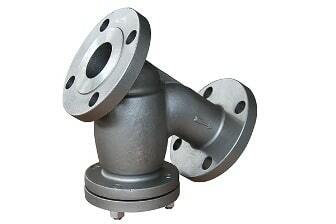 The effective operation of this API Y strainer prevents the damage and downtime of the industries throughout a lifetime and is what makes it the outperformer against rivals, available in the assorted materials and specifications all over India and overseas countries at the lowest possible rates.